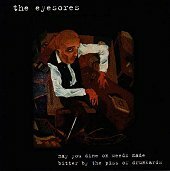 On their debut album, Providence, Rhode Island's the Eyesores give rock 'n' roll mayhem a run for its money. With their eclectic, cotton candy eating, throwing up on rides, scared of clowns sound that is as close to the carnival experience as you're likely to get without being at an actual carnival, these guys know how to make you remember the fun you had at carnivals as a kid. Fusing everything from Celtic and gypsy styles to rock, pop, country & western and, of course, carnival music, the band transforms themselves into actual musical carnies. The first time I put on this album I hated it; the novelty wore off pretty fast. It sounded to me as if it were cheap carnival music that had no substance and no point. Well, it may be cheap carnival music, and may have no immediate point, but the substance is fun, and it is filled with it. As I listened to it a few more times (just to understand what went on in this band's head), it sort of grew on me. Songs like "Nausea," "Defenseless," "Hustle," and "Blue" were just too cooky not to find interesting; amusing at the very least. So, as I sat back and listened more and more, the point of just having fun, exploring the crazy thoughts that go on in your head, and doing what you want to do came to mind. It's still a very weird album, but in the context of weird it thrives. As a party album, something to kick back and enjoy, or something to just put a smile on your face, this album really works. It may take a while before the initial cloud of smoke begins to dissolve so you can see things clearly, but once it does, you'll find the humor in this album and grow to enjoy it too. I'll give it a B-. Eyes of the Betrayer: Recovery Eytan Mirsky: Get Ready For Eytan!